What do you get when you “blend” gallons of gore, a clever story, and pitch-black humour? A rip-roaring, brain-scrambling, lung-aching comedic blood-fest that’ll give your entire body a run for its money. If this happens to sound like your diabolical, twisted, hemorrhaging cup of tea. Watch “Your Next” at a local theatre and drink in the laughs, carnage, and fear until you get your fix. Which shouldn’t take too long considering this abhorrent, funny, and down-right disgusting nightmare is oozing with all the necessary, horrifying accoutrement. This soon-to-be cult favourite puts its own unique stamp on home invasion flicks. And although there isn’t much presented that’ll revolutionize, when the hunters become the hunted, redefining the genre is the last thing on any given horror enthusiasts mind. With a classic, almost giallo feel and an absolutely awesome soundtrack. “You’re Next” is a strong contender for horror flick of the year. A wealthy family heads up to their remote vacation house to celebrate the parents anniversary. Each sibling has brought their loved one with them and the first evening is spent getting to know one another. At dinner, things begin to unravel when sibling rivalries and jealousy works its way into the meal. When things get heated, one of the guests is murdered by an unknown assailant. Little does the family realize that they are being hunted and their night of terror has just begun. It’s rather difficult to summarize the tension, violence, and gory substance of “You’re Next” into perspective. Every aspect sort of congeals together to such an extreme satisfaction that these facets now, somehow transcend all definition and memory to become something you’ve never experienced before. The genuine effectiveness of the onslaught, ferocity, and expelling of human innards is nearly unprecedented. It seems as if every five minutes your looking away or cringing, not out of terror, but gleeful disgust. The viewer is so willing to abandon all morality just to urge on the brutal assault and keep the ending of human lives progressing. Honestly, I can’t remember a time when mayhem, bloodshed, and disconcertion was so tasteful. Never has watching continuous murder and being subjected to physical torture been so much fun. “You’re Next” perfectly encapsulates what horror is and should always be. During the first five minutes, my bud, who normal despises watching horror films, turns to me and says “I guess they’re just gonna get right to it,” which made me chuckle…but the laughs didn’t stop there. The hilarity is paced and constant throughout “You’re Next,” but make no mistake, it is the darkest of humour and is definitely not for everyone. Which shouldn’t really surprise anyone considering that writer Simon Barrett knows his target audience fairly well and tends to stick to what he does best. That being said, “You’re Next” is without question his best outing to date. Barrett’s bizarre, witty, and savage script is devilishly captivating. And although the story isn’t overly original, it is definitely unique. Littered with quips, brute force, and what seems like an endless stream of unrivalled kills and household murder weapons. Barrett’s melodramatic family never stood a chance, much to the delight of viewers everywhere. As much as the violence, story, and laughs are left up to the scribe, the tension and overall effectiveness of the screenplay is placed in the hands of the director. 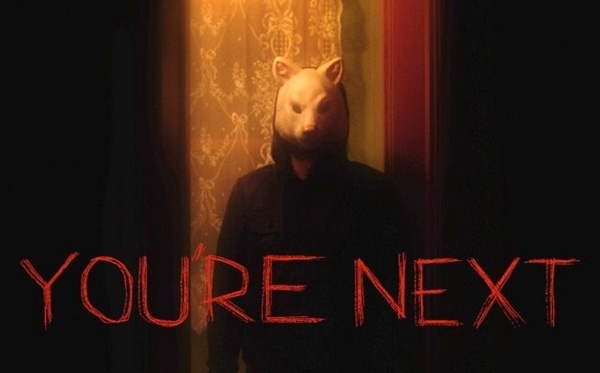 “You’re Next” is fortunate to have such an imaginative and ruthless writer like Simon Barrett and a firm, visonary director of Adam Wingard’s caliber. The two play off each other extremely well, which is why the film is so abundantly successful. Throughout “You’re Next,” I lost count of how many times Wingard’s excellent camerawork spawned an unbearable amount of strain and nervousness. He doesn’t just capture the imagery amongst the carnage and destruction. Wingard absorbs it through the lens and expels it with meaning purpose. A truly magnificent job done by the pair, both on and off screen. I also want to mention “You’re Next’s” outstanding soundtrack. It has this old-school, slasher feel to it which melds perfectly with Barrett and Wingard’s visuals. Rarely does a film rely so heavily on the collective performances of its ensemble instead of individual bright spots. “You’re Next” is a terrific example of how a casts ability to invest, collaborate, and perform as a singular unit benefits the general efficiency and power of the films material. In all honesty, apart from Sharni Vinson and Joe Swanberg, it’s nearly impossible to differentiate the strength in performances of the supporting cast. Seeing as they’re all so equally outstanding and potent. The group doesn’t force the humour, terror, or violence either, every aspect of their portrayals is smooth and authentic. That being said, without question Sharni Vinson is the shining star here. Her performance supersedes all others and should be enough to launch her into the mainstream. As for Joe Swanberg, he is so incredibly and consistently frustrating and hilarious, it’s insanely hard not to give him kudos. Bloody, violent, and decidedly funny, “You’re Next” is further proof that the genre isn’t dying. You’re Next: 8.5 out of 10. Posted on August 27, 2013, in Horror and tagged Barrett, Horror, Swanberg, Thriller, Vinson, Wingard. Bookmark the permalink. 28 Comments. Thanks! Definitely one of the best of the year so far, so much fun :). Good review Joseph. I can’t say I was all that scared with this flick, but I did have a great time just basking in all of the violence, gores and chills. Thanks a bunch! Yeah, other than the first half-hour, it wasn’t overly terrifying. But like you said, it was tons of fun to watch and really enjoyable. God I can’t wait to see this. Check it out as soon as you can. Completely worth the price of admission! I’m with Nick. This really looks quite good, and this review confirms that. The Conjuring, now this. . . 2013 is at least pulling itself together from a horror perspective. Don’t forget V/H/S 2, that was also a terrific horror flick released in 2013. But yeah, check this one out, just an outstanding horror film. yeah, wow. I really need to see V/H/S 1 and 2. don’t’ know why i keep putting that off lol. Maybe because they’re spooky lol. Nice review man. I have seen heaps of positive reviews of this from people who I trust (such as your fine self) so will definitely be checking it out. Think it opens here tomorrow, so will try and get to it over the next couple of weeks. Thanks! So honoured that you trust me :). It really is quite the horror flick, such a surprise. I had high hopes for it, but wasn’t ultimately sure it would succeed. Definitely check it out when you can! Thank you so much! Happy to hear you liked it as much as I did. I’ll definitely check out your blog as soon as I can and toss you up on the BR. Thanks for the follow :). Thank you Tim! Look forward to hearing your thoughts on this one :). Loved your ‘blend’ in joke! This film has restored my faith in the future of horror! Lol, thanks! Same here, been quite the year for modern horror :). Okay – that’s 99% of bloggers here loving this one. I was going to skip it in the cinema but I’m not so sure now. Do not skip it! You’re Next is so much fun! Loved your review! I really enjoyed this one; gory, suspenseful and with the toughest, most fearless lead actress…haha! Thank you so much :). Couldn’t agree more, a truly great modern horror flick!